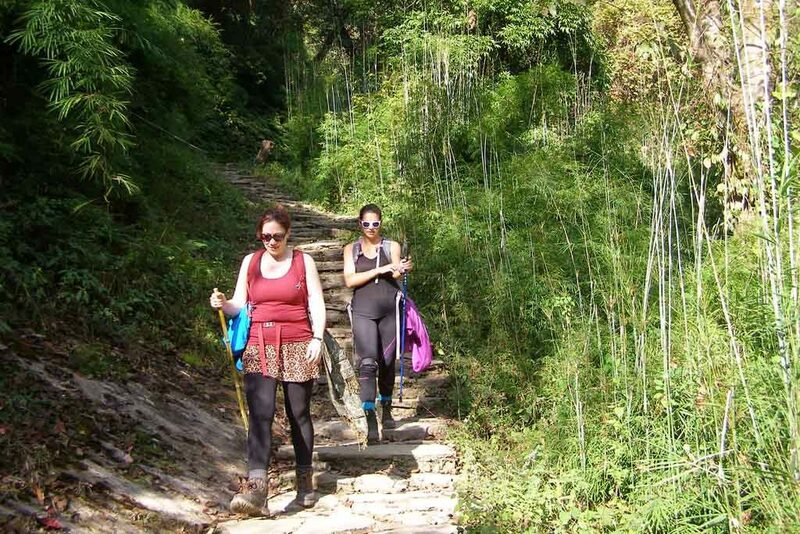 Searching for an easy trek in Nepal with family and children? Then Poonhill is the right option. 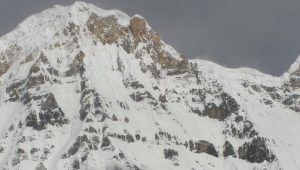 Poonhill (Pun Hill) is located in the Annapurna region of Nepal towards the north of Pokhara. 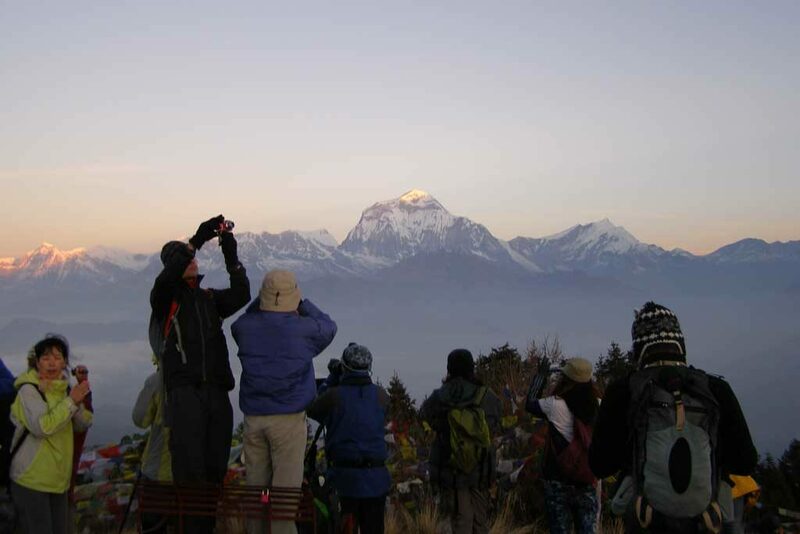 Poonhill Ghorepani trek is one of the most popular short treks in Nepal ideally good for short time trekking holiday. It lies on the foothills of the Annapurna Himalayan range. 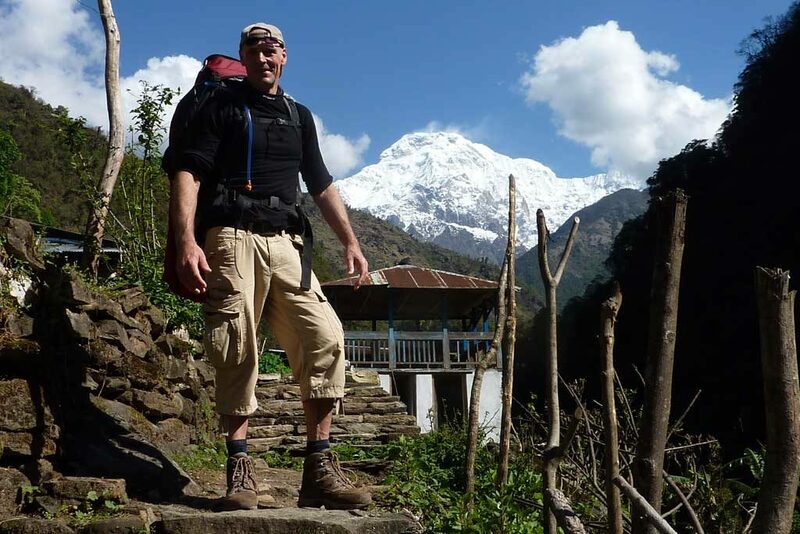 The trek also covers some part of the Annapurna Base Camp trek. The significant highlight of this trek is undoubtedly the climb of Poonhill located at 3,210 meters (10,532ft) from sea level. 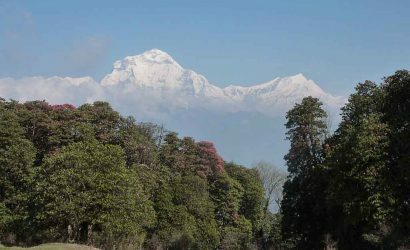 Poonhill is the outstanding viewpoint for the spectacular and panoramic views of the snow-capped mountains including Annapurna (8,091m/26,546ft) and Dhaulagiri (8,167m/26,796ft). Our guide will wake you up early morning to catch the stunning sunrise view from Poonhill. One of the popular villages of Poonhill-Ghorepani route is Ghandruk (Ghandrung). Ghandruk has a large traditional settlement of Gurung ethnic tribe. The views are simply spectacular following the well developed trekking trail. 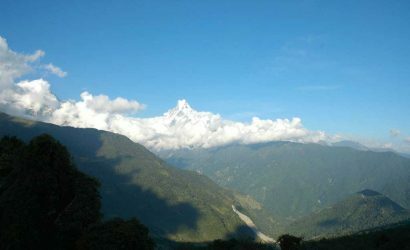 The enchanting villages of Gurung and Magar tribe, dense rhododendron and alpine forests with the picturesque Machhapuchhre Peak (Fishtail) dominating the skyline make the trek tremendous. Rhododendron is the national flower of Nepal. Poonhill Ghorepani trek becomes more colourful and attractive with the rhododendron flowers during spring. Drive/fly from Kathmandu to Pokhara (884m/2,900ft). Today we have a 200km (124 miles) drive (6-7 hours by bus or car) from Kathmandu to Pokhara. We take a tourist bus that leaves at 7am from Kantipath, near Thamel. This is a scenic drive along the bank of the Trishuli River with great country side. Alternatively one can also fly between Kathmandu and Pokhara. Drive from Pokhara to Nayapul then trek to Tikhedhunga (1,540m/5,052ft). We start our trek after one hour drive from Pokhara to Nayapul. Dropping down a short slope from the main road, we pass through a collection of shops and teahouses. A short distance further on we pass a string of shops and teahouses. At a junction of trails we cut left and arrive at the attractive village of Birethanti (1,040m/3,412ft) which is situated at the confluence of the Modi Khola and Bhurungdi Khola (Rivers). Birethanti has numerous lodges and shops. Proceeding over the suspension bridge over the Modi Khola, we come to the ACAP (Annapurna Conservation Area Project) check-point; continuing on we pass through Matathanti and Sudame – both with refreshment facilities before we reach Hille (1,430m/4,692ft) where there are more lodges and teahouses. After a comparatively short uphill plod from Hille, on the east bank of the Bhurungdi Khola, we will reach our overnight stop, the village of Tikhedhungga (also called Tirkhedhunga) which has a camp site and several lodges, some of which are run by ex-Gurkha soldiers. Trekking time 4-5 hours. Trek Tikhedhunga to Ghorepani (2,860m/9,383ft). Today we head off for Ulleri en-route for Ghorepani, first crossing the Tikhedhunga tributary and then the Bhurungdi Khola, to its west bank. 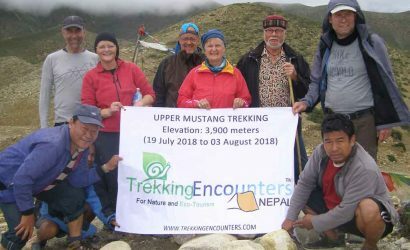 From this point we climb steadily on a very demanding ascent of no less than 3,000 stone steps to arrive at the attractive Magar village of Ulleri (1,960m/6,430ft). Here there are striking views down into the valley and over to the impressive peaks of Annapurna South, Hiunchuli and Machhapuchhare (Fishtail). The trail continues through a cultivated region, enters a forest and reaches the settlement of Banthanti (2,210m/7,251ft), its name literally meaning “the place in the forest”. The village sprawls in a long line beside the trail and has a number of lodges and teahouses. Continuing on from Banthanti and still climbing gently, we enter a forest of rhododendrons, which are magnificent in springtime and after just over an hour reach Nayathanti or Nanggethanti (2,430m/7,972ft), which has a number of lodges in a forest clearing. From here the trail continues to climb through rhododendron and oak forests and eventually reaches our overnight stop Ghorepani. 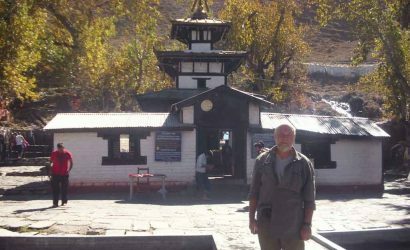 This village has a bustling collection of trekker’s lodges and camping grounds and the route is the most heavily trekked in Nepal, because so many visitors want to see the sunrise from Poonhill. The name Ghorepani or Ghodepani means “horses water” and we will notice the horse-troughs that give the village its name. Trekking time 5-6 hours. Trek early morning Ghorepani to Poonhill (3,210m/10,532ft) then to Tadapani (2,650m/8,694ft). A Poonhill sunrise is one of trekking not-to-be-missed experiences – it is unique. Therefore as the climb to the summit, among rhododendrons, takes about one hour, we will set out on a path from the centre of the village at least one hour before sunrise. There is a lookout tower on the highest point and below it is a very welcome tea station. Having enjoyed this experience we will then head off for Tadapani via Banthanti (3,180m/10,433ft), which we should reach in just over 2 hours from Ghorepani. From here the route makes an undulating traverse of the steep wooded mountainside, then descends again through forest to the head of the Bhurungdi Khola’s valley, crosses a bridge and then winds its way steeply up another wooded hillside, finally emerging through a saddle into Tadapani, our overnight stop. Incidentally Tadapani means “far water” where Tatopani you will recall means “hot water”. The “far water” title dates back to times before a piped supply came to this remote lodge settlement and water had to be carried here from afar by locals and porters. The fairly large lodges provide spectacular views across the Kimrong Khola (River) valley to Annapurna South and Machhapuchhare. Trekking time 6-7 hours. Trek Tadapani to Ghandruk (1,940m/6,365ft). For today’s trek to Ghandruk, there are two options available. Initially the path out of Tadapani drops steeply through the forest to a clearance where there is a junction. The left fork joins the path linking Ghandruk/Ghandrung and the village of Kimrongdanda and enters the township from the north, whereas the other route makes a more direct approach and enters Ghandruk at its western end. Ghandruk is a large and important Gurung village set high upon an open terraced hillside, with uninterrupted views of Annapurna South, Hiunchuli and Machhapuchhare. 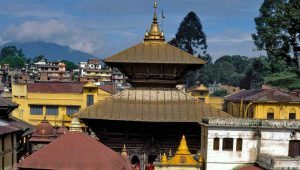 In addition to several shops, teahouses and more than twenty lodges, it also has a health post, a post office, a telephone office, a police post, an ACAP visitor centre, a Gurung museum and a gompa. Gurung are members of an ethnic group living in the hill areas around Gorkha and Pokhara. 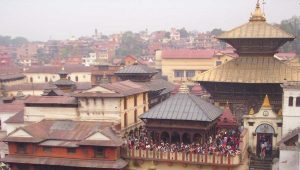 Ghandruk is one of their biggest settlements. Trekking time 2-3 hours. Trek Ghandruk to Nayapul via Birethanti (1,040m/3,412ft) and drive back to Pokhara. Today is our final trek and we set off southward from Ghandruk passing through a kani then down steps. Shortly after this we come to a junction where we keep to the right and head straight on, coming to Chane, where there are a few teahouses. From here the trail descends steeply with paved steps for much of the way, until we reach the multi-level village of Kimche (1,640/5,380ft) in which there is an altitude difference of about 250 meters (820ft) between the upper and lower sections of the village. Proceeding on downhill we first come to the village of Syauli Bazaar (1,220m/4,003ft) and then Chimrong (1,140m/3,740ft) with a flagstone trail on part of the way between the two villages, of which the former has several lodges and the latter a group of teahouses. En-route between the two settlements we will pass between fields of rice and millet. 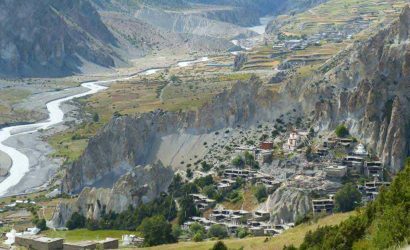 From Chimrong we continue to the large attractive village of Birethanti (1,040m/3,412ft). After a farewell rest and refreshment break in Birethanti, we have a short trek to Nayapul where we board our transport for an hour drive to Pokhara, Nepal’s biggest tourist town. 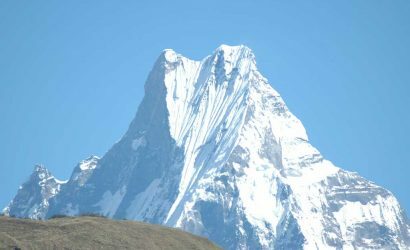 It has all the facilities and places of interest that one could possibly want and it is situated on the eastern shore of the gorgeous Phewa Tal (Fewa Lake) and the skyline is dominated by the perfect pyramid of Mount Machhapuchhare (6,997m/22,957ft). Trekking time 4-5 hours. Drive/fly from Pokhara to Kathmandu. We are more relaxed in Pokhara with the beautiful morning and later we drive or fly back to Kathmandu. Regular tourist buses leave at 7am.